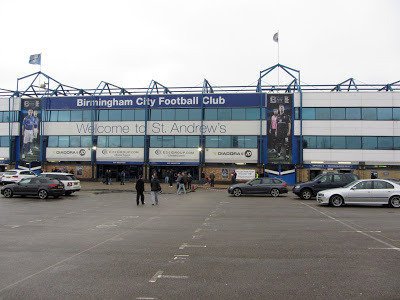 My fourth stadium of 2013 was on Saturday 9th March 2013 at St. Andrew's in Birmingham, West Midlands. 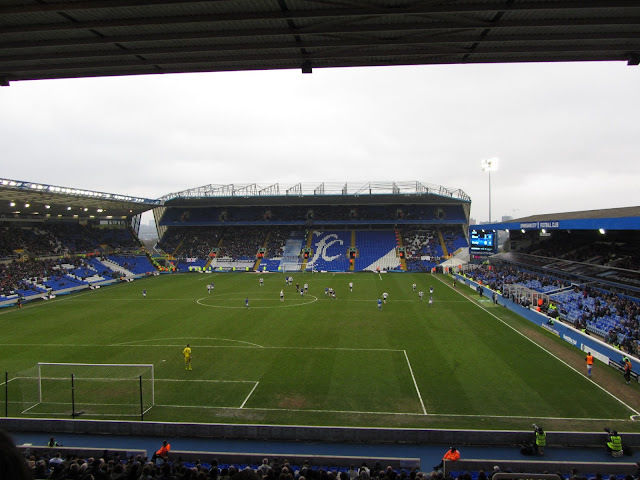 The match was Birmingham City vs. Derby County in the Football League Championship. 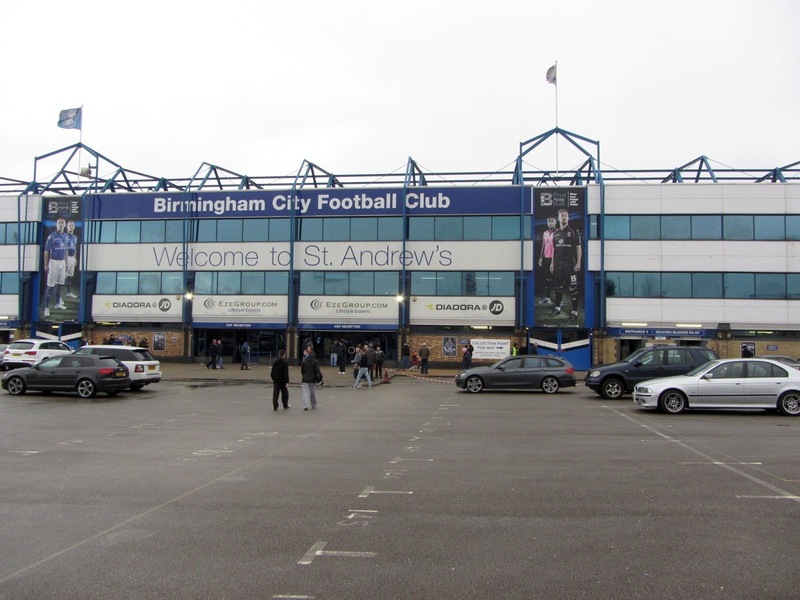 St. Andrew's is located in the Bordesley district of Birmingham just to the east of the city centre. The ground is half a mile from Bordesley railway station and has been home to the club since 1906. The stadium was extensively renovated during the 1990s with just the Main Stand remaining largely unchanged. This two-tier stand runs along the pitch on the northern side of the ground and has a row of executive boxes separating the two tiers. With a capacity of around 5,000 it is the smallest stand in the venue. Adjacent to this on the western side of the venue is the Railway Stand. 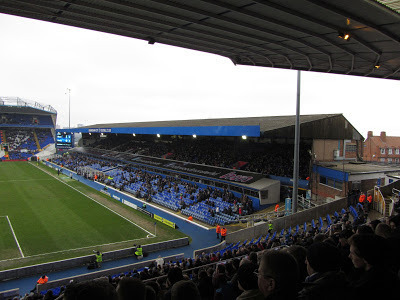 This 8,000 capacity stand consists of one large lower tier and one small upper tier with the lower tier containing the section where away fans are located. The remaining two stands are joined together with a combined capacity of 17,000 seats. The Kop Stand runs alongside the southern end of the pitch and then joins up with the Tilton Road End at the eastern portion of the venue. The Kop Stand features much of the stadium's hospitality including executive seating. By comparison the Tilton Road End is the only area in the ground without any corporate facilities. The game witnessed a very dull first half in which neither side could muster a shot on target until around the half-hour mark. Derby were the better of the two sides during the opening 45 minutes and shortly before they break they took the lead. Ben Davies was able to stab home from close range after the home defence failed to react to Craig Forsyth's looping header into the box. The visitors almost grabbed a second straight after this and Birmingham were booed off the pitch at the interval after a lacklustre performance. However, the hosts improved greatly in the second half and were much more effective at closing down Derby and pushing them back into their own half. 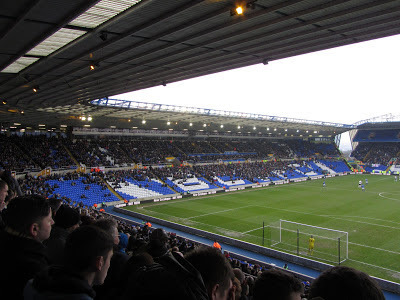 Birmingham came very close to equalising after 60 minutes when Callum Reilly's 20-yard effort thundered back off the crossbar but the home side did not have to wait too much longer to get their goal. In the 67th minute Wes Thomas turned a Derby defender in the penalty area and rifled his shot into the roof of the net. From this point on Birmingham dominated proceedings and in the 75th minute they took the lead when Nathan Redmond unleashed a crisp shot from just outside the box which found the bottom corner of the net. In injury time the home side rounded off their win when a long ball upfield was headed on by Nathan Redmond and Wes Thomas steered his shot past the Derby goalkeeper. A home win did not seem on the cards at half-time but a much better display in the second period ensured that Birmingham were able to claim a 3-1 win.